About three weeks ago my summer peaked. And it had nothing to do with hiking a mountain with my kids. In fact, it happened right here in lil’ old Steubenville, Ohio. 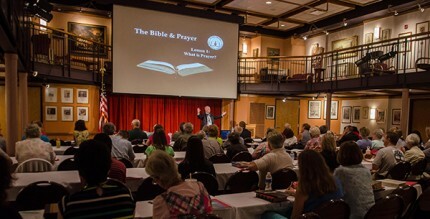 It was the St. Paul Center’s annual Applied Biblical Studies Conference which we co-sponsor with Franciscan University of Steubenville. It was a special conference not only because of the world-class lineup of speakers (e.g. Scott Hahn, Brant Pitre, Michael Barber, Jeff Cavins, etc…), but also because the conference actually got underway with almost two hundred people arriving a day early to go through Journey Through Scripture (JTS). Many of you know that JTS is our dynamic parish Bible study program that’s been rocking Catholics for a couple years shy of a decade. The program is exploding as regular lay people experience the life-changing truth of the Sacred Page. But we’re just getting started. This year we added the sixth study to the series called “The Bible and Prayer,” based around my new book Prayer Works! Getting a Grip on Catholic Spirituality (which you can purchase through the Center’s online bookstore). It was a perfect way to get the main conference started…and I’m not the only one who thought so. If you are interested in learning how to bring Journey Through Scripture to your diocese, parish, or group, just call the St. Paul Center at 740-264-9535. God bless!